We drive the lineup and find it has lots of push and fuel economy in a tight, quiet package. 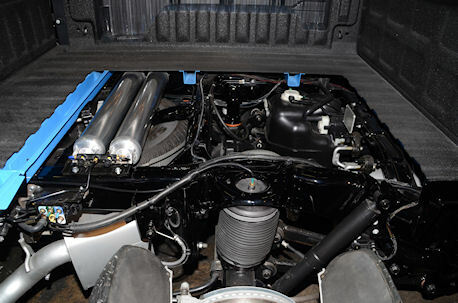 The planned mild upgrade on the popular half-ton Ram 1500 pickup for 2013 got a little out of hand and ended with a ground-up redesign aimed at making the vehicle the most fuel efficient machine in its class. 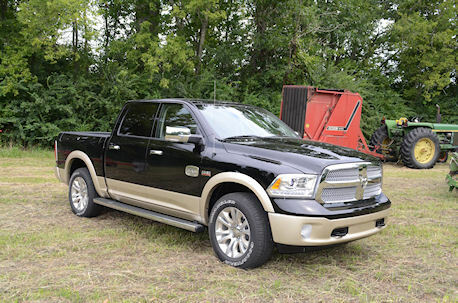 We drove several of the new Ram 1500s recently and found them to be extremely tight, quiet and well-finished. The model handles extremely well on roads of all types with electric rack-and-pinion power steering. And, with a 305 horsepower V6 Pentastar engine and the venerable 395 hp. 5.7 Liter Hemi V8 as choices, the new truck has plenty of roll-on power -- particularly through the new optional TorqueFlight 8-speed automatic transmission (the top two gears are both overdrive ratios). One of the keys to Ram's good fuel mileage is the new smooth-shifting 8-speed electronic TorqFlite transmission. Amazingly compact for all the gear work, the unit features overdrive ratios in the top two gears. Mileage estimates for 3.6L V6 (with variable valve timing) and the 8-speed transmission, lead the V6 pickup class for 2013 at 17 miles per gallon city and 25 highway. The fuel efficiency comes from a host of "little things" that add up to 20% better performance than the 3.7L engine in previous models. Engineers whittled weight on the vehicle with higher strength steel, a tuned cooling and fuel delivery system for maximum efficiency, they added a 4-position air-suspension chassis to allow for off road clearance needs as well as to take advantage of drag reduction -- and ease of loading and entering the vehicle -- and provided for the engine to shut off during extended stops, and automatically restart when the brake is released. Exterior style changes also reduced the drag coefficient of the 1500 to that comparable to many crossover SUVs. A real market-changer is the 1500's air-suspension system that allows one or two inches additional ground clearance for off-road work, kneeling for loading and easy access to the vehicle, and an automatic lowering on the highway to reduce air drag. The Hemi version with the 8-speed is also a leader in its V8 pickup class in fuel economy that comes from variable valve timing and cylinder shut-off technology, although official EPA ratings were not available when we drove the machines. At the top of the line, the Longhorn model sports ALL leather accoutrements and real wood trim. The rear seats of all quad-cab models fold flat with speakers mounted beneath -- to provide more storage room than competing trucks. The gear shift selector is gone from the column on the 8-speed transmission models. The selector arm has been replaced with a handy rotary gear selector knob on the dash at the driver's right hand. The rotary selector communicates with the electronic-shift gearbox wirelessly, and quite easy to use. Forced up and down shifts are available with a touch of a button on the steering wheel -- and they are almost imperceptible, as are normal upshifts from start to highway speed. The interior of the Longhorn edition of the Ram 1500 for 2013 smells like a saddlery from the generous use of leather on its very comfortable, supportive seats. The machine features the 395 horsepower Hemi V8 and an all-new TorqueFlight 8-speed automatic transmission. The 2013 Ram 1500 is an excellent example of what a highly-competitive marketplace can do for consumers. The truck brings loads of new technology to the table, and at what Ram executives say will be a "very competitive" price point.